YOU CAN'T AFFORD TO IGNORE INFLATION! Many investors and advisors today have become complacent about inflation's impact on retirees, because inflation has been at historically low levels in recent years. This is in sharp contrast to the elevated inflation rates we saw during the late 1970s. While "Comfortably Numb" is a great representative of 1970s classic rock, it is not a great approach to planning for the effects of inflation today. Let's take a step back to lay some more groundwork. Inflation refers to the rate at which the prices of goods and services rise. Different goods and services experience rising costs at different rates, so we typically hear about the average inflation rate. The consumer price index (CPI), which shows below the steadily rising prices since the 1970s, may be the most common general measure of average inflation. Since the end of World War II, the annual rate of inflation has averaged 3.8%. It has been as high as 7.4% during the 1970s, but well below 2% in recent years. 1. Inflation depletes purchasing power. The rule of 72 is a well-known and simple method of calculating 1) how long it takes an investment to double at a given rate of return, or 2) how long it takes an investment to lose half its purchasing power at a given inflation rate. For example, if we use the 3.8% average inflation rate since World War II, a portfolio's value today would be cut in half in about 19 years (72/3.8 = 18.95). At the 1.7% inflation rate of the most recent decade it would take more than 42 years (72/1.7 = 42.35). 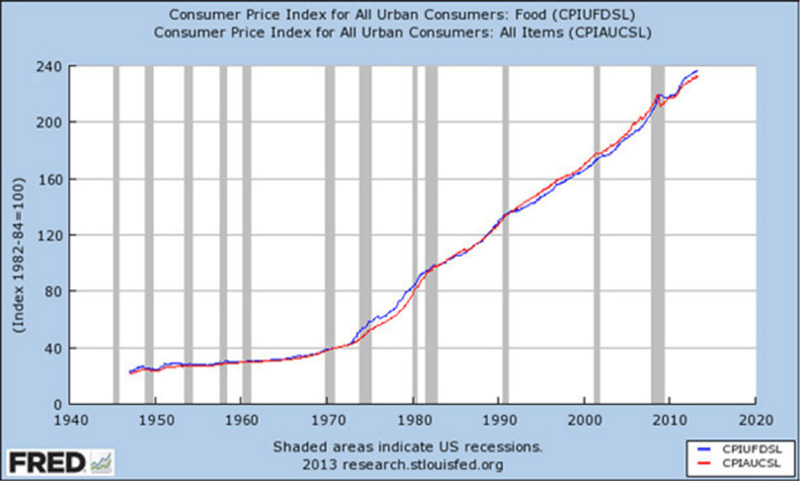 But at the 7.4% inflation rate of the 1970s, it would take less than 10 years (72/7.4 = 9.73). For someone aged 65, average inflation would cause their spending power to drop by 50% around age 84, not unrealistic by life expectancy standards enjoyed today. 2. Inflation erodes savings. Inflation doesn't literally reduce the number of dollars you have saved, but it does reduce the value of those dollars. The interest rate your bank savings account is paying is almost certainly well below the rate of inflation, which means that the cost of goods and services is climbing much faster than the value of each dollar in that savings account. For example, assume your annual budget for 2018 requires a net total income of $50,000. You can expect that purchasing exactly the same goods and services 5 years down the road, in 2023, will cost more with inflation. That's why many employers, and even social security, periodically offer cost-of-living increases to help you keep pace. Unfortunately, your savings account doesn't get a comparable raise. On average, each dollar you own loses value every year because of inflation. 3. Inflation undermines budgets. During retirement, when you're no longer a full-time wage earner, budgeting becomes especially important. To help increase the likelihood that your savings will last through retirement, you'll have to establish a budget. The problem is that - as stated above - $50,000 per year in 2023 is expected to buy fewer goods and services than it did in 2018. And in 2028, $50,000 will buy even fewer goods and services than it did in 2023. You get the picture. So as a retiree, you'll need to give your budget a cost-of-living adjustment every couple of years in order to continue buying the same goods and services. If you remember earlier in this white paper, we referred to average inflation as measured by the CPI. Unfortunately, not everyone lives an "average" life and retirees may be more exposed to certain types of expenses than the general population. For example, medical costs are on the rise, and they're significantly outpacing CPI inflation averages. In retirement, you're likely to need more medical care than you do at a younger age, so carefully consider medical inflation as you plan for retirement. Food costs can be volatile. For example, dairy, beef and grains have seen pricing spikes in recent years due to factors such as drought, livestock illnesses and changing farming practices. Expect more of the same in the future. WHAT CAN YOU DO TO FIGHT INFLATION DURING RETIREMENT? First, as you calculate your retirement needs, you must incorporate inflation into your plan. Proper planning isn't just about identifying what you need to live your same lifestyle over the next few years, but also decades from now. WT Wealth Management has clients in their late 70s, 80s and even a few lucky souls in their 90s. If Americans today are going to live for 15, 20 or even 25 years in retirement, then inflation risk needs to be considered. Second, retirees need to remain properly invested for their time horizon - and that usually means remaining invested in a diversified portfolio that includes a significant allocation to equities. While retirees should gradually move to a more conservative portfolio as they approach and enter retirement, it's critical to select a mix of investments likely to at least keep pace with inflation. Bonds, money market funds, and bank savings accounts, which are generally considered relatively safe places to put your money, may not provide enough growth to outpace inflation. We feel most retirees still require a diversified portfolio that includes allocations to stocks, and other investment classes that will add a prudent level of growth potential to your portfolio. Because many of our clients will easily live 20 or 25 years post retirement, let's look at the impact one more time. WT Wealth Management is uniquely positioned to assist retirees in their pursuit of the retirement dream. As a firm, we concentrate on participation in rising markets, out performance in declining markets and preservation of capital. We understand that having 30, 40 or even 50% of your retirement assets exposed to the equities markets while in retirement may feel too aggressive. But with increasing life expectancies and the need to plan for decades (and not just years) in retirement, it has become the new "norm". 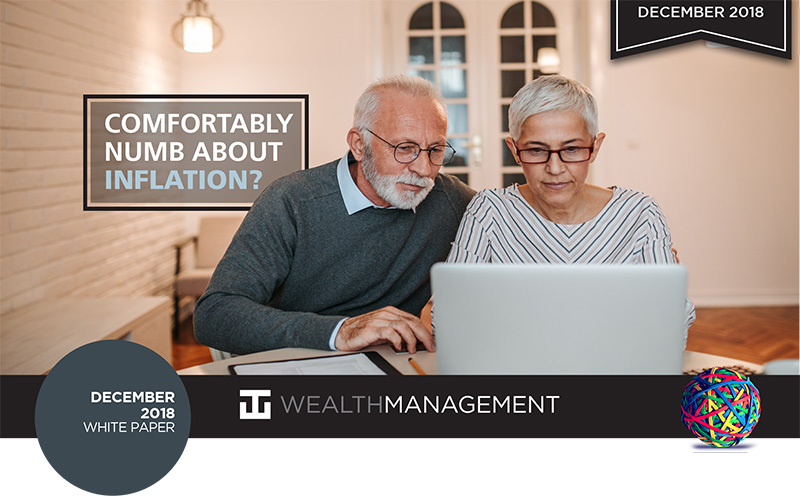 Please contact your advisor to further discuss the impact of inflation on your retirement plans and start the formal discussion about the steps to insure inflation doesn't erode your quality of life post-retirement. WT Wealth Management is an SEC registered investment adviser, with in excess of $100 million in assets under management (AUM) with offices in Flagstaff, Scottsdale, Sedona and Tucson, AZ along with Jackson Hole, WY and Las Vegas, NV.